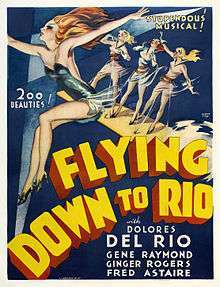 Flying Down to Rio is a 1933 American Pre-Code RKO musical film noted for being the first screen pairing of Fred Astaire and Ginger Rogers, although Dolores del Río and Gene Raymond received top billing and the leading roles. Among the featured players Franklin Pangborn and Eric Blore are notable. The songs in the film were written by Vincent Youmans (music) and Gus Kahn and Edward Eliscu (lyrics), with musical direction and additional music by Max Steiner. 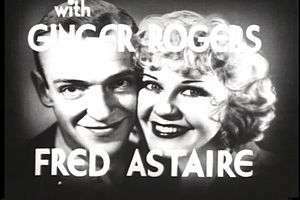 This is the only film in which screen veteran Rogers was billed above famed Broadway dancer Astaire. The black-and-white film (later computer-colorized) was directed by Thornton Freeland and produced by Merian C. Cooper and Lou Brock. The screenplay was written by Erwin S. Gelsey, H.W. Hanemann and Cyril Hume, based on a story by Lou Brock and a play by Anne Caldwell. Linwood Dunn did the special effects for the celebrated airplane-wing-dance sequence at the end of the film. Composer Roger Bond (Gene Raymond) and his orchestra are appearing in Miami, with vocalist Honey Hales (Rogers). 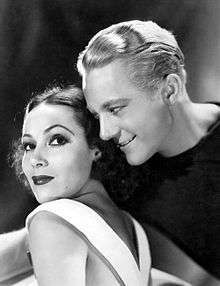 Despite the warnings of accordionist and assistant band leader Fred Ayres (Astaire), Roger is attracted to the beautiful and flirtatious Belinha (Dolores del Río) in the audience, he leaves the bandstand to pursue her. Doña Elena (Blanche Friderici), Belinha's chaperone, is informed of this, and arranges for Roger and the band to be fired. But Roger pursues Belinha to Brazil, and organises as engagement for the band at the Hotel Atlantico in Rio de Janeiro, unaware that the hotel is owned by Belinha's father (Walter Walker). Roger persuades Belinha to allow him to fly her there in his private plane, which runs into trouble inflight, forcing a landing on an apparently deserted island. Under the moonlight, she falls into his arms, while admitting to him that she is already engaged. In Rio, Roger informs his good friend Julio (Raul Roulien) that he has fallen in love, but finds out that Belinha is engaged to Julio. During rehearsals for the Hotel's opening (a brief bit of Astaire tap), Fred is told by police that the hotel lacks an entertainment license. When Roger spots a plane overhead, he comes up with the idea of strapping dancing girls to planes, with Fred leading the band and Honey and Julio leading the planes. The show is a great success and the hotel's future guaranteed. Julio gives Belinha up to Roger while Fred and Honey celebrate. All the songs in Flying Down to Rio were written by Vincent Youmans (music) and Gus Kahn and Edward Eliscu (lyrics). The dance director was Dave Gould, assisted by Hermes Pan, who went on to be Astaire's primary choreographer. "Carioca" – sung by Alice Gentle, Movita Castaneda and Etta Moten, danced by Fred Astaire, Ginger Rogers and the chorus; this is notable for being Astaire and Rogers' first dance together; they dance with their foreheads touching. According to RKO records the film made $923,000 in the US and Canada and $622,000 elsewhere, resulting in an estimated profit of $480,000. ↑ Billman, Larry (1997). Fred Astaire - A Bio-bibliography. Connecticut: Greenwood Press. p. 82. ISBN 0-313-29010-5. ↑ Erickson, Hal (2015). "Flying Down to Rio". AllMusic. Retrieved June 13, 2015. ↑ "Flying Down to Rio". Reel Classics. 2009. Retrieved June 13, 2015. Wikimedia Commons has media related to Flying Down to Rio (film).